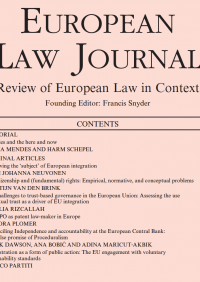 Cecilia Rizcallah, researcher at the Centre, publishes an article in the last issue of the European Law Journal. It is entitled: “The challenges to trustbased governance in the European Union: Assessing the use of mutual trust as a driver of EU integration”. The article deals with the use of the principle of mutual trust as a principle of governance in the internal market as well as in the area of freedom, security and justice.